The ratio is used to compare two quantities. These quantities must have the same units. The ratio is represented by “:”, which is read as “to”. We can write it in the form of “fraction”. Write the ratio of the height of Sam to John, where Sam’s height is 175 cm and john’s height is 125 cm. The ratio of Sam’s height to John’s height is 175: 125 = 7: 5. We can write it in fraction as 7/5. The equivalent ratio is like the equivalent fractions so to find the equivalent ratio we need to write it in the form of a fraction. To find the equivalent ratio we need to multiply or divide the numerator and denominator with the same number. Find the two equivalent ratios of 5: 20. First multiply it by 2. So the two equivalent ratios are 10:40 and 1: 4. To compare that the two ratios are equivalent or not we need to convert them in the form of like a fraction. 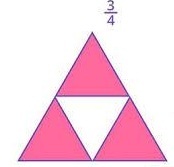 Like fractions are the fractions with the same denominator. Check whether the ratios 2: 3 and 3: 4 are equivalent are not? To check, first, we need to make their denominator same. 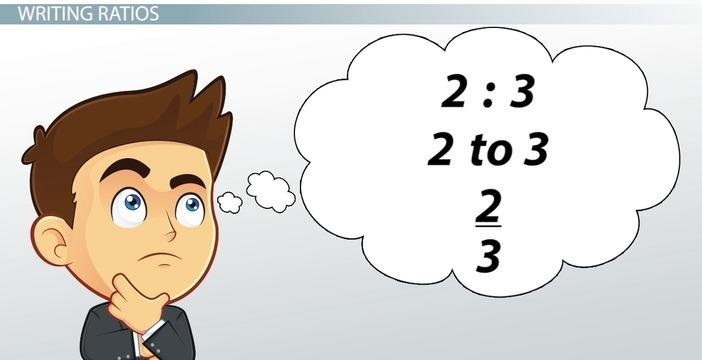 Hence the ratio 2:3 is not equivalent to 3:4. 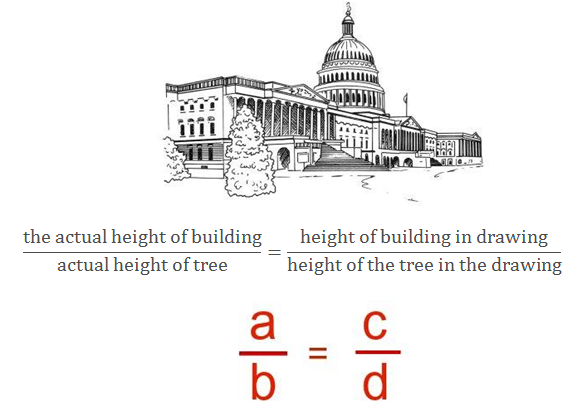 Proportion shows the equality between two ratios. If two ratios are in proportion then these must be equal. How to solve proportion problems? If the cost of 8 strawberries is Rs. 64 then what will be the cost of 25 strawberries. The percentage is another way of comparisons. In ratios we have to make the denominator same then only we can compare them but in percentage, we can compare by calculating the percentage of the given quantity. The percentage is the numerator of the fraction with the 100 denominators. What is the percentage of boys and girls in the class of 100 students if the number of boys is 55 and the number of girls is 45? If the total number of quantity is not hundred i.e. the denominator is not hundred then to find the percentage we need to make the denominator 100. Out of 4 bees, 2 are going right and 2 are going left. So what percentage of bees is going right? 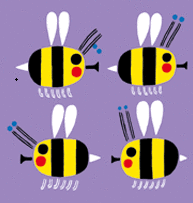 Out of 4 bees, the number of bees going right is 2. Fractional numbers have different denominator and to convert them into percentage we have to multiply the fraction with the 100%. Out of 15 fishes, 5 are red. 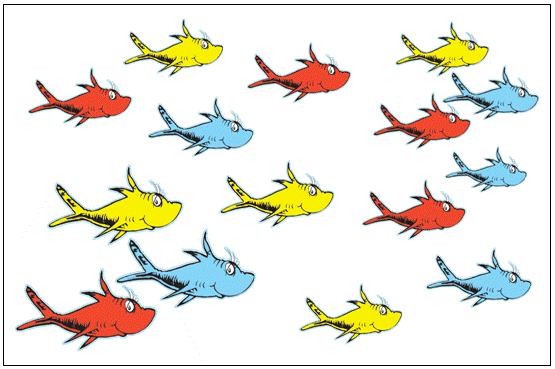 What is the percentage of the red fishes? 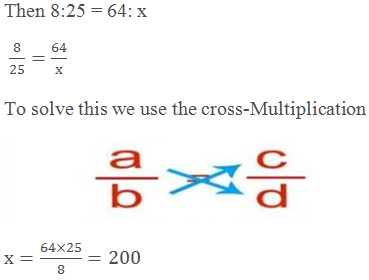 To convert the decimal into a percentage, first, we need to convert the decimal into fraction then multiply it by 100%. Convert 0.65 into a percentage. Multiply the decimal with the 100%. We can reverse the above process to convert the percentage into fraction or decimal. If we know the one part of a whole then we can find the other part because all the parts together form a whole or 100%. If there are 25 men in the office of 100 employees then the remaining 75 would be women. This means that if 25% are men the (100% - 25%) = 75% are women. With the help of percentage, we can estimate the parts of an area. What percent of the given figure is shaded? First, we have to find the fraction of the shaded portion. To use the percentages in real life we must be able to interpret the percentage. If we say that Seema is spending 20% of her income then it means that Seema is spending Rs. 25 out of every Rs. 100 she earns. Converting percentages to “How many”. If 20% of students get a distinction out of 45 students in a class, then how many students got the distinction? The number of students got distinction = [20/100] × 45 = 9. Hence, 9 students out of 45 got the distinction. If the profit of Rs. 2500 is divided among three partners in such a way that A, B and C got the two parts, three parts and five parts of profit respectively. How much money will each get? What percent of the profit do they get? Sometimes we have to find the increase or decrease in certain quantities as a percentage. Like the increase in population, decrease in sale etc. The total marks of Charlie increased from 365 to 380 from last year’s result. Find the increase in percentage. Amount of change = increase in the number of marks = 380 – 365 = 15. Cost price is the price at which you buy some product. It is written as CP. Selling price is the price at which you sell something. It is written as SP. These are the factors which tell us that the sale of some product is profitable or not. 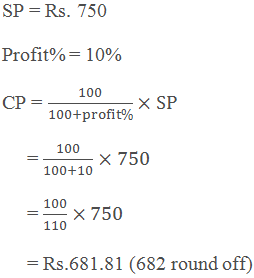 If the buying price (or CP) of a table is Rs 700 and the selling price (or SP) is Rs 820, then find the profit or loss. As the SP is more than CP, so the seller earns the profit in the table. The profit and loss can be converted into a percentage. It is always calculated on the cost price. If the cost price of a laptop is Rs.45000 and the selling price is Rs. 50000, then what is the profit or loss percentage? 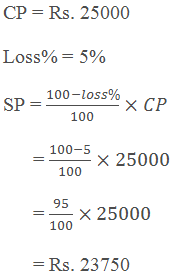 How to find SP if CP and profit or loss % is given? If the cost of a TV is Rs.25000 and shopkeeper sells it at a loss % of 5% then what is the selling price of the TV? 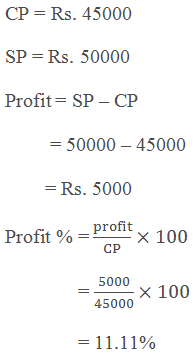 How to find CP if SP and profit or loss % is given? If the Selling price of a bookshelf is Rs 750 and the profit made by the seller is 10% then what is the cost price of the bookshelf? Hence the seller bought the bookshelf at the cost of Rs. 682. When we borrow some money from the bank then we have to pay some interest to the bank. The money which we borrow is called the Principal. The amount which we have to pay to the bank to use that money is called interest. At the end of the year we return the money to the bank with interest, that money is called Amount. Sunita borrows a loan of Rs 5,0000 at 15% per year as the rate of interest. Find the interest she has to pay at end of one year. Total amount to be paid by Sunita at the end of one year = Rs.50000 + Rs. 7500 = Rs.57500. If we have to calculate the interest for more than one year then we have to change the time period only. In the above example if Sunita takes the loan for 3 years then what will be the total amount after 3 years? Total amount to be paid by Sunita at the end of 3 years = Rs.50000 + Rs. 22500 = Rs.72500.